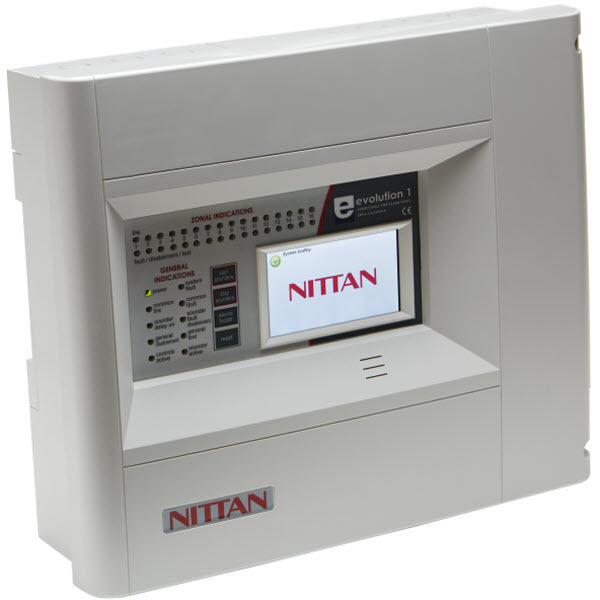 The “evolution 1” control panel offers complete compatibility with the award winning range of Nittan evolution detection and alarm devices and has been designed with the needs of both installer and end user in mind. For ease of use it comes complete with a 4.3 inch touch screen display plus an intuitive and easy to use menu structure. Complex cause and effect matrix can be set up via the onboard touch screen and menu structure or using the PC tools and downloaded to the panel. The clean cut, classic lines of the ABS enclosure make it attractive yet unobtrusive for the end user, with a completely removable front cover to improve installer access for cabling and termination. Flexible architecture means everything from a single stand alone panel, to a 16 panel network, can be achieved without any additional hardware. 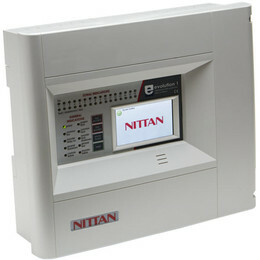 Use of the “Nittan Portal” will allow remote access and interaction via multiple levels of secure password protection. Easy to use configuration software. Full cause and effect programming at Panel or PC Configuration tool. Up to 254 devices on the loop. Network Card built in for networking up to 16 panels. Remote Access via the “Nittan Portal” (Future Development). 2 x configurable rs485 ports. Up to 8 password protected users. EN 54 part 2 and part 4.